At Sharp, we try to cook with the most beneficial appliances and ingredients to keep our lifestyles moving in the right direction. In fact, Sharp’s innovative superheated steam ovens have helped our team achieve a simply better life. If you haven’t heard about the Sharp Superheated Steam Countertop Oven, you need to read on. 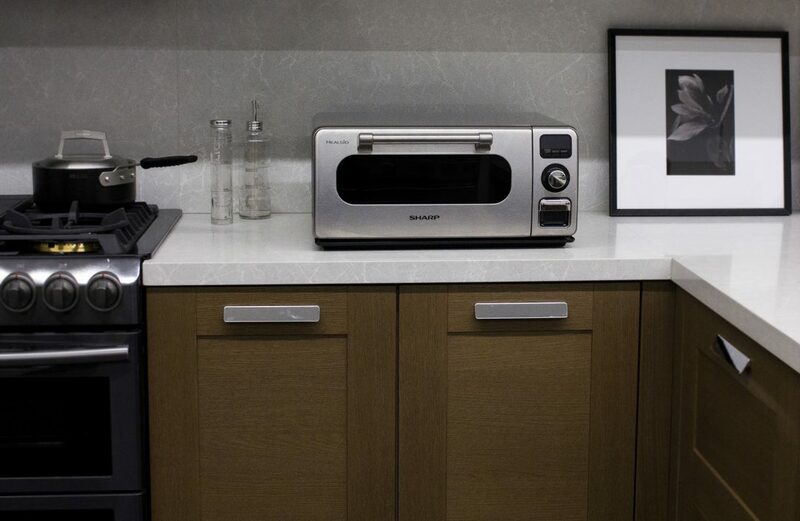 This countertop oven is designed to be the start of a cooking revolution. The innovation is simply that steam can be hotter than you think, cook better than you imagined, and support a healthy lifestyle. The combination of superheated steam and conventional, radiant heat in all cooking modes means that food will be crispy and browned on the outside, moist, and delicious on the inside. There are five reasons that Sharp’s Superheated Steam Countertop Oven is a must-have for every U.S. kitchen. This product is not a traditional steamer or steam oven. The countertop oven combines superheated steam up to 485°F with conventional, radiant heat. This combination makes proteins like fish and chicken become brown and crispy on the outside, while holding their moisture on the inside. You’ll be amazed to see sugars on your food caramelize quickly. Trust me, the cooking results are amazing! Personally, I find it frustrating when I have to wait for my oven to preheat after a long day at work. For one reason or another, I always manage to forget to defrost my meats and end up waiting so long for them to defrost, I give up and order takeout. 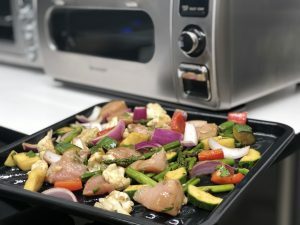 However, with this new Superheated Steam Countertop Oven from Sharp, you won’t need to preheat your oven before cooking or even defrost the food the night before. Finally, I can simply place food into the oven and set the desired cooking mode, temperature, and time. Talk about Simply Better Living! 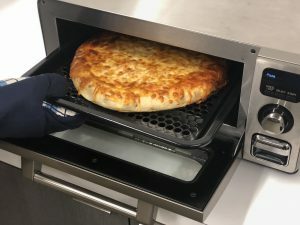 With multiple cooking modes, this countertop oven provides endless cooking possibilities and will eliminate the need for multiple small countertop appliances. Finally, you will have countertop space to use a cutting board! It can broil or grill, bake or reheat, cook pizzas, warm food, and also create 7 shades of toast! Just the other day I was doing a comparison test in my wall oven and my new countertop oven. I used my Sharp broiling pan in my Superheated Steam Countertop Oven and a disposable half tray in my wall oven. 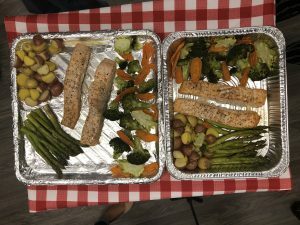 I prepared a salmon sheet pan dinner in both trays which included potatoes, broccoli, cauliflower, and asparagus seasoned with salt, pepper, parsley, thyme, and lemon juice. After cooking both sheet pan dinners on 485°F for 14-15 minutes, I decided to do a blind taste test with the twins. 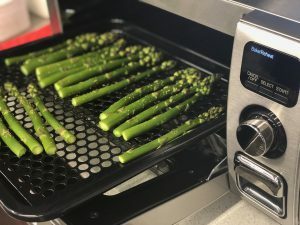 All-in-all the results were unanimous, the salmon, asparagus, cauliflower and broccoli cooked in the Superheated Steam Countertop Oven were moister than the salmon, asparagus, cauliflower and broccoli cooked in the wall oven. However, 15 minutes was not long enough in either ovens for the baby potatoes to fully cook. So if you are tempted to give this blind taste test a try with your new countertop oven, I would recommend saving the baby potatoes for later and substituting with some tasty brussel sprouts. Whether you are making dinner rolls, a baguette, or a brioche, baking in a superheated steam oven gives you a moist crumb and a crisp crust. With a large cavity size, a cupcake pan also fits easily inside of this countertop oven and allows your cake to cook evenly throughout. I started baking my family’s old fashion Italian ball cookies in my superheated steam countertop oven and have been pleasantly surprised by the results. Traditionally, the cookies have always been a little dry for my family’s liking, and we have made them moister with a thick coating of anise icing. However, because of the superheated steam generated and circulated throughout the countertop oven’s cavity, my ball cookie recipe has lost its dry touch. This product has a mode specifically for pizza, which is much handier than you might think. On Friday nights, I put the twins’ favorite pre-made, frozen pizza on the included crisper tray and after cooking it for 15-20 minutes on pizza mode, it tastes just as fresh as delivered pizza. I use this mode primarily to heat up my Sunday leftovers during the week. The fantastic part about this feature is that the radiant heat combined with superheated steam leaves my leftovers as fresh as the day that I cooked them. While I like my bagels crispy on mode six, the twins prefer theirs to be much lighter. Thankfully, there are multiple toasting options that provide similar results each and every time. 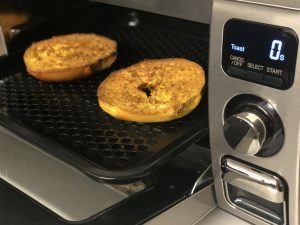 Plus, with the size of the ovens cavity, I can toast multiple bagels at a time saving plenty of time for arguing over butter or cream cheese. 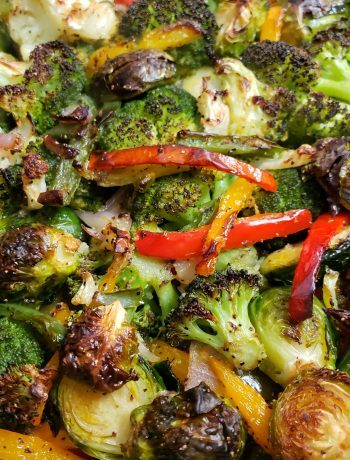 Goodbye take out boxes, hello sheet pan dinners! 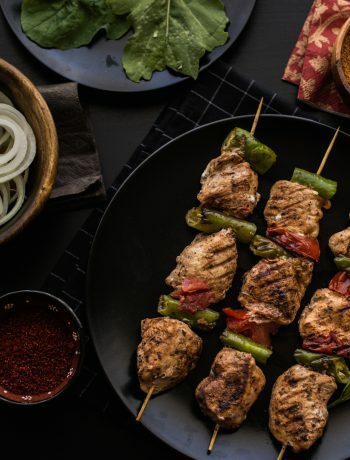 I like to think of myself as a mindful cook and I know firsthand that making intricate meals after a long day at work is neither simple nor practical for everyone, so the idea of having a whole dinner seasoned and in one pan sounds like a plan to me. 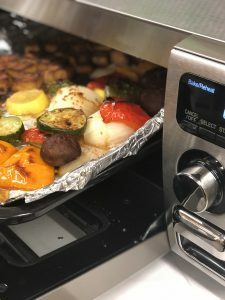 With sheet pan cooking in mind, I need to highlight that included with your countertop oven purchase are both a Broiling Pan and Crisper Tray (12.5″x12.5″) providing the ability for 2-tier-cooking. 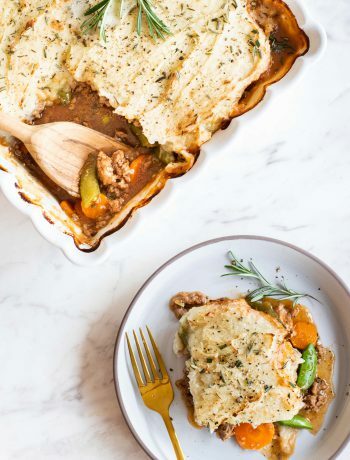 These items are 40% larger than a standard, quarter-size sheet pan, which leaves TONS of room to cook easily and relatively mess free for a family of four. The oven is also large enough to handle up to 9 slices of toast or a 12 inch pizza covering all of the leading frozen pizza brands. This in itself makes every parents’ day much easier. I usually cook a quick pizza on Fridays, make some popcorn in my Orville Redenbacher Countertop Microwave Oven, and have family movie nights each week. 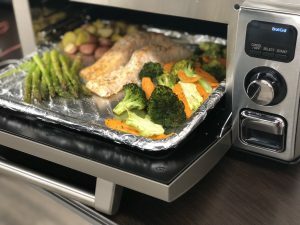 I have to say, for anything from making sheet pan dinners for the whole family, to hors d’oeuvres for party guests, the Sharp Superheated Steam Countertop oven has you covered. This personal, powerful, low-profile oven heats up instantly to save you time, money and energy. Make it your “everyday-oven”, and save the large oven for “special-occasion cooking.” There is a hidden bake element is beneath the flat oven floor making my clean-up a breeze. This really sets this oven apart from most other countertop ovens. Also, I have to mention the convenient front-loading water tank– it is easy-to-access and easy-to-fill with regular tap or bottled water. It’s the perfect size and provides up to 60 minutes of cooking time before refilling! Plus, 485° superheated steam brings reheated foods back to life. It is no longer necessary to call them “leftovers”. The dedicated REHEAT setting keeps food so moist and flavorful, you can call them “second helpings”. If you are looking for more than just a toaster oven, this is the answer. The Sharp Superheated Steam Countertop Oven is a powerful, sophisticated, premium, stainless steel appliance for your kitchen.